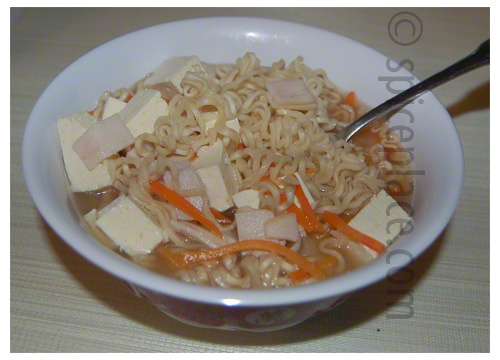 as a base for Chicken Noodle Soup, in mashed potatoes, in Ramen Soup in place of the little packet of fake flavors, as the flavor in chicken gravies, use in place of water when making rice, etc. Many years ago, we used to make one big pot of chicken soup, adding all of the ingredients and ending up with, well, a lot of chicken soup. If you make a nice flavorful chicken broth first, you get an ingredient you can use to flavor lots of other recipes. So these days, when we’re planning on making a chicken soup, we first make a broth, and strain it (reserving the chicken meat). Then we measure out enough of our magic golden liquid to make just enough chicken soup for our family’s meal, add some meat, shredded carrots, celery, onion and noodles (Matzo balls). All done, and we have a lot of Chicken Broth left over to use to flavor many more meals. Rinse the chicken thighs and place in a large pot. Prepare the vegetables. Don’t fret too much about chopping them nicely. We’re only using them for flavor, and they’ll be discarded when done cooking. Add all of the vegetables to the pot. Fill the pot to within 1″ of the top lip. Cover, and bring to a boil over high heat. Reduce heat to keep the broth at a low simmer. Cook covered for 4 to 6 hours. 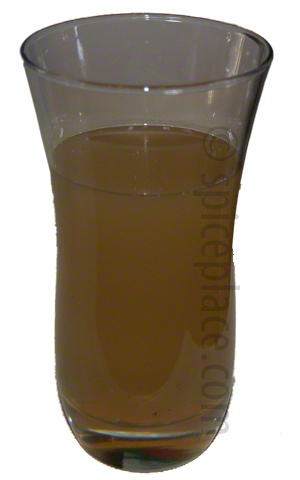 Place a large wire mesh colander in another pot large enough to hold the liquid and strain the broth. Pick the chicken thighs from the colander and remove the bones and skin. Shred the meat by hand or use a knife to chop. It’s very tender and should fall right off of the bones. Discard the vegetables, chicken bones and skin. For a clearer broth, rinse the colander well, line with cheese cloth and restrain. If time permits, let the broth cool, then chill in the refrigerator. When completely chilled, scoop any of the solid white fat that forms on top. Add the Homemade Chicken Broth to a medium saucepan. Add vegetables and bring to a boil. Reduce to a simmer, and cook vegetables for 2 minutes. Add Ramen noodles, and Chinese Five Spice. Set timer and cook noodles for 2 minutes. Remove from heat, add tofu and chicken. Pour into a boil and enjoy. Back in the olden days, I worked in an Italian themed restaurant doing the low end chores that a lad of 16 would be offered. I actually had a fun time doing menial tasks, and the restaurant had a fun gang to work with. It was a really busy place too. Way back then there were ‘themed’ restaurants. At GD Graffitti Syndicated, the theme was a depression era sleep-easy. The decor of GD Graffitti’s was a late 1920’s to early 1930’s speakeasy. The waitresses and waiters dressed in gangster outfits, with the menu items appropriately named such as ‘Lefty the Lobster.’ It was a really popular restaurant with a stupendous salad bar that came with the meal. Remember that this was in the olden days, and this was the beginning of the salad bar. Even in the modern era you’d be hard pressed to find a salad bar that could match what Graffitti’s provided, over 200 different items with at least 8 kinds of melons alone. As part of being the hired help, we’d get a free meal at the end of the night. Generally everyone wanted the higher end foods, but to tell the truth they had a killer soup called Cacciucco that was offered as a main course. It was truly a great soup, and I ate it often. They made it in this huge steam pot that could hold 50 gallons or more of soup. Wow! This is a two step recipe. Put 2 quarts of water in a large souppot. Add the remaining ingredients, except the wine. Bring to a bowl, and then simmer for 30 – 45 minutes. Add the wine, and allow to simmer 5 – 10 minutes to allow the alcohol to evaporate. Cut the Lobster tail and the cod into bite sized pieces and add to the stock. Wash the mussels and add to soup. Cook for about 10 more minutes. Serve with fresh breadsticks and garlic-butter. 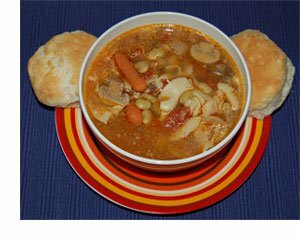 There’s nothing secret to making a good homemade beef vegetable soup. It’s really all about taking your time and letting the soup cook to allow the flavors to blend together. We make our beef vegetable soup completely from scratch. There’s no need for any of those kits from the grocery store. All you really need is to plan ahead, and make a beef broth first. Patience is called for in making this soup. So about 6 hours before serving, place 4 large beef soup bones in a large stockpot, and cover with water. Place over medium heat and begin to heat to a boil. While the water is heating, dice up a large onion, and 1 1/2 cups of celery. Toss the onion and celery in the pot, cover, and bring to a boil. Once the water is boiling, reduce the heat, and simmer, covered, for about 2 hours [longer is better]. Using a set of tongs, remove the bones from the pot and place on a dinner plate. Allow to cool 5 minutes or more, or until you can handle. Scrape any marrow from the bones onto the dinner plate, and discard the bones. Add the marrow back to the stockpot. Cook for another 15 minutes. Remove from heat, and allow to cool a little before serving. Serve with buttered toasted sourdough bread, or piping hot biscuits. You can add salt to the served bowls of Beef Vegetable Soup but we don’t find it necessary. 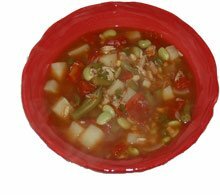 Refrigerate any left over Beef Vegetable Soup, and add a little water when reheating. Beef vegetable soup always tastes better the next day. Here’s a recipe we make regularly, especially on busy week nights. It’s fairly quick to make, and we serve it as the main course for dinner. It can also be made as an appetizer, and should be placed in small bowls when used as the appetizer. 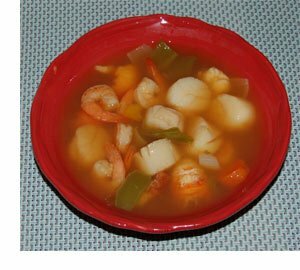 This soup is simply wonderful with Vidalia onions, and spring is coming soon, so if you don’t feel like making this now, print this recipe and keep until April when the Vidalia onions are in season. Cut onion in half. Put on cutting board flat side down and slice in thirds. Cook onions until tender and slightly brown. Put beef broth in saucepan with bay leaves and heat till hot. Add cooked onions to hot beef broth and cook 3-4 minutes. You can subsitute chicken broth for the beef broth for an equally good French Onion soup. Here in our new blog, we’re focusing on cooking home cooked meals with herbs and spices, that are easy to make on a weeknight, are generally low in fat, use the seasonings we sell, and above all taste good. So, tonight we made a different dinner using leftover crabmeat, Old Bay Crab Soup. If we asked 5 of our friends to tell us how they eat blue crabs, we may not hear one that mentions crab soup. Most would likely mention steamed crabs, or crab cakes, but crab soup is a treat in itself and is worthy of honorable mention 2nd place when compared to the most common replies we’d expect. You might ask, better than crab cakes? To which we’d reply, “it depends”. Certainly in terms of having a healthy meal the crab soup wins hands down. Now here in Maryland, Crab Soup is served at many a restaurant. Lot’s of times it’s served in crab houses as an appetizer and it’s so common that many a grocery store have it regularly in their soup pots at the salad bar. In the all-you-can-eat crab houses, it’s often used as a filler food to reduce the number of crabs you eat. But as far as filler foods go, this is one heck of a treat and it’s a quality meal unlike filler foods like hush puppies, french fries, and french breads. When we make Old Bay Crab Soup it’s our main dish and not a filler food. Since it’s a great meal in itself and we serve the soup with buttered and toasted sourdough bread. The one special ingredient that we feel makes crab soup so special is the use of Old Bay Seasoning. The unique blend of spices in Old Bay, and its natural affinity with seafood make it the perfect seasoning for crab soup. 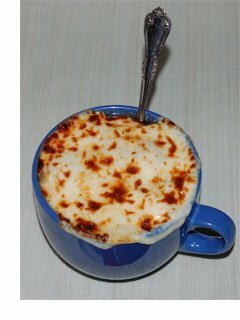 On spiceplace.com we have two different recipes for crab soup that use Old Bay, Maryland Crab Soup and Delmarva Crab Soup. Both of those recipes make one heck of a lot of soup and aren’t suited for weeknight dinner meals. Start by heating 2 cans of low sodium beef broth and 2 cups water in a 3 quart sauce pan . While the beef broth is heating, dice 1/2 of a medium sweet onion, and 2 stalks of celery. Place the onion and celery in a non-stick frying pan, and cook them over low heat about 5 minutes. Then add the onion & celery to the beef broth, along with 1 1/2 tbsp of Old Bay Seasoning. Once the broth comes to a boil, add 1 cup frozen shoepeg corn kernels, and 1 cup bay lima beans. Allow the corn and lima beans to cook for 5 minutes, then add 1/2 pound of crabmeat. The crab meat doesn’t have to be the premium lump crab meat, but it should be cook quality such as backfin (and not claw crabmeat). Cook for another 5 minutes and serve with toased sourdough bread.